Week 10 of the NFL season saw a multitude of injuries at prime positions for fantasy. Matt Schaub and Michael Vick owners can’t be pleased with their injury status, so QBs are the flavor of the week in addition to RBs. The entire Broncos’ backfield nearly went down Sunday as well, opening the door for Lance Ball. We won’t know exactly who is starting for the Eagles until closer to Sunday, but if it’s not Vick, it’ll likely be Young. Young has the skill to do a lot of damage to any defense if he has his head on straight. Hunter may have to split time with starter Frank Gore this week, but I can assure you that he’ll get the same if not the majority due to Gore’s injury. 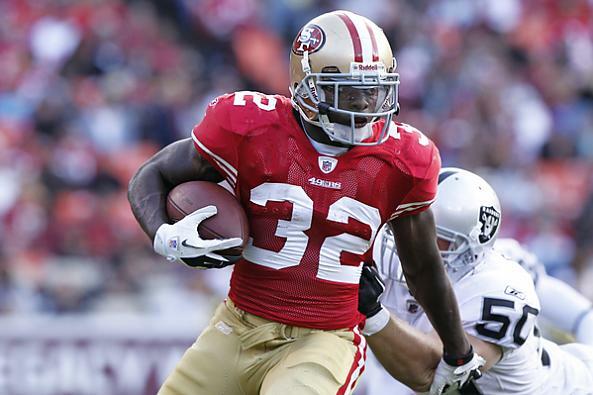 The Niners won’t want to risk anything with Gore, so I’m sure Hunter will see extended time. Ball is now the only runner in Denver’s backfield that isn’t injured. Although starter Willis McGahee’s injury isn’t severe, you can expect Ball to get the majority of the carries against the Jets. With Denver’s run-heavy offense, Ball is sure to get at least 70-80 yards. I’m sure you didn’t know who he was either, but Brown has been the Chargers’ best WR over the past two weeks. Brown has nine catches for 186 yards and a score over the past two weeks and will start against Chicago on Sunday opposite of Vincent Jackson. Douglas exploded last week in wake of WR Julio Jones’ hamstring injury, catching eight balls for 133 yards. Douglas should see more time on the field due to Jones’ injury, but he’s an erratic player. Start him only if you absolutely need to. The Ravens finally found some use for their talented tight-end last week. Dickson hauled in a whopping 10 receptions for 79 yards and two touchdowns. Dickson is still wildly inconsistent, but keep an eye out on his progress from here on out. Chi Side of Chambana · Chicago sports, music and fashion. What else do you want?